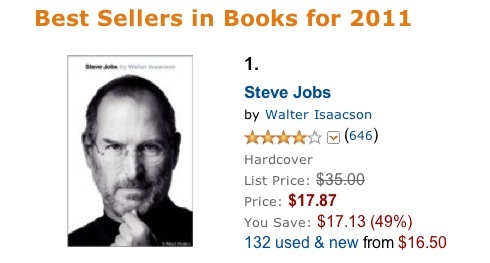 The official biography of Steve Jobs by Walter Isaacson is now the number one best selling book for 2011, according to Amazon.com’s best sellers list . The book was released October 24 and quickly shot to the top of charts in the wake of Jobs passing. It’s a compelling read covering the immensely fascinating life of Steve Jobs, and it was deemed interesting enough that Sony Pictures Entertainment bought the rights to make a movie based upon the biography. The book is currently discounted to $17.87 from Amazon , it’s a good book for anyone interested in Steve Jobs and the history of Apple, and makes a great gift for the holiday season.